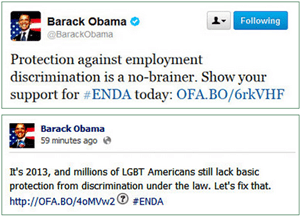 Last night President Obama (or his staff) went to Twitter and Facebook to post his support for ENDA, the embattled 20+ year old bill that has been sitting in Congress that would grant the LGBT community workplace protections from being fired because of who they are which they currently do not have in the United States. A link within the email redirects to the OFA site, which allows the reader to sign a petition calling on Congress to pass ENDA. After the reader enters an email address, another page pops up asking for a donation to OFA in several designated amounts up to $1,000. But what is NOT CLEAR whether the donations will be used for ENDA, the OFA or other purposes. Meanwhile in the LGBT community we have TWO groups now that want to be the ones representing (and taking the credit) for ENDA if it passes battling for control. Next up in the ENDA Control Battle Royal we have the newly formed (and “Gay Inc.” big bucks backed.) Americans for Workplace Opportunity created just 3 months ago in July led by the Human Rights Campaign and the National Gay & Lesbian Task Force. Also besides these two groups we also have the remnants of the now defunct, original “United ENDA” coalition from the early 2000’s still milling about in the background. 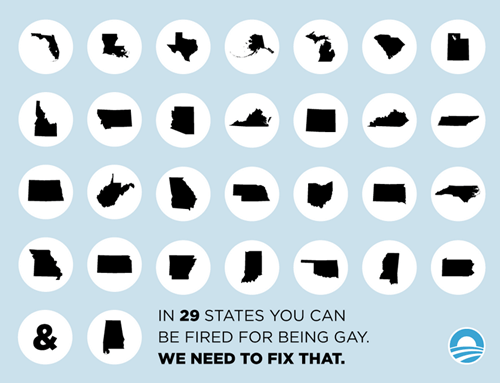 So can one really wonder why ENDA still sits waiting after 20+ years and our LGBT brothers and sisters are still discriminated in 29 states? The answer is politics. Politics from within our government and petty politics from within our community. Which in the end hurts ENDA’s chances even more.